A couple of weeks ago, I published a post listing ten ways to rock your fundraising in 2019. If you haven’t read it yet, go on over and take a look. It’s now February, and that means you have plenty of time to put these ideas into action. You have time to figure out how all of this can work for your nonprofit. And that includes #4: Factor regular acquisition tactics, such as Facebook fundraisers, small house parties, email list-building, direct mail acquisition, and crowdfunding, into your yearly fundraising planning. Keep it focused on one or two and you’ll see greater success. When it comes to developing a clear fundraising plan for the year, you want to pick what you can master and focus on it. Email list-building is an acquisition tactic that I recommend highly. And social media has the potential to be a powerful tool for your nonprofit, too. In fact, you can leverage your social media channels to grow your email list. In 2018, one our favorite trainers and bloggers, Julia Campbell was a featured guest on Motivate Monday, a free weekly 30 minute training for nonprofit professionals. Julia shared her presentation, Five Ways to Grow Your Nonprofit Email List With Social Media. In it, she provided invaluable insight on how you can integrate your email and social media for maximum effectiveness. I love her honest approach to email list-building, too. She knows that when it comes to goal-oriented emails, it’s about having the right people on your list, not chasing 100k subscribers. Think about it. Would you rather have 10,000 engaged readers or 20,000 folks who don’t remember who you are and toss your content into the trash? If you haven’t already (or if you need a refresher), you should take a seat with your beverage of choice and give Julia’s Motivate Monday session a listen (feel free to fast forward to the 6:55 mark). You want great fundraising results for 2019, but you also know it’s not just about this year…it’s about the long-term. When you have the right systems in place, you can make sustainable fundraising happen at your nonprofit. And that’s why I highly recommend Bloomerang’s donor management software. Check it out here. Providing your sign up details will get you a free video demo. If you want results that are built to last, and if you’re about keeping your donors on board (who doesn’t? ), then chances are, this is the software for you. If you haven’t been joining us for Motivate Monday, why not? Think about it. 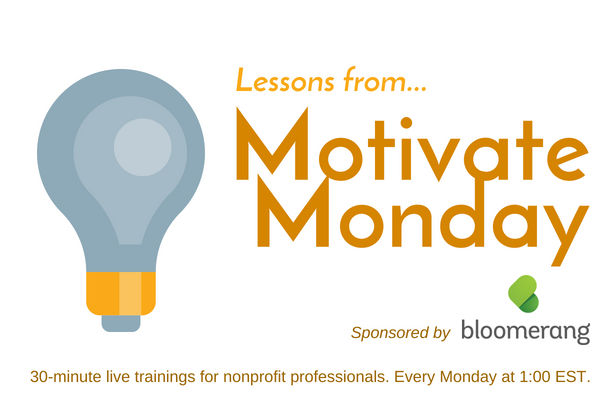 A power half-hour to kick your week off right, featuring awesome nonprofit pros giving free trainings, and other awesome nonprofit pros sharing their wins. It’s inspirational. You really ought to be there.